1962 was the year the 1950’s ended. It would all begin to change in 1963 with the assassination for JFK, Martin Luther King delivering his ‘I Had A Dream’ speech, The Warren Commission, the murder of Medgar Evers and the British Invasion, all events along with the Vietnam war that would define a generation just coming on to the stage. George Lucas set his second feature film right at the closing door of America’s final days of innocence when we still thought anything was possible and it was all ours for the taking. Lucas sets the film in a teenage world still led by 1950’s and early 1960’s cultural icons like James Dean and Sandra Dee. It is a world where television still presents shows like “Father Knows Best” and “The Adventures of Ozzie and Harriet” as the typical family norm. It is a world still innocent of the upheavals that it will be facing, yet the realization is there that the current stage is about to change. In the course of one night in a small Northern California community, Modesto, where Lucas grew up, we watch a series of intertwining vignettes focusing on four friends Steve Bolander (Ron Howard), Curt Henderson (Richard Dreyfuss), John Milner (Paul LeMat) and Terry “The Toad” Fields (Charles Martin Smith) on the night of their High School graduation dance. The next morning, Steve and Curt are uncomfortably preparing to leave their small town life behind and head off to a college in the Northeast. The center of their nightlife is the local Drive-In, Mel’s, a hangout for picking up girls and listening to rock and roll hits one after the other, songs like “Goodnight Sweetheart, Goodnight,” “Heart and Soul,” “Surfin’ Safari,” played by the local DJ, one Wolfman Jack, grace the soundtrack. The continuous free flowing music Lucas gives us here is, like for many of us, a lifeline, a connection to the times, our youth and to each other. Lucas gives us a snapshot of a teenage American ritual in this one night; cars, high school dances, cruising, drive-in’s, going steady where the most important thing in life is still the friends you grew up with. 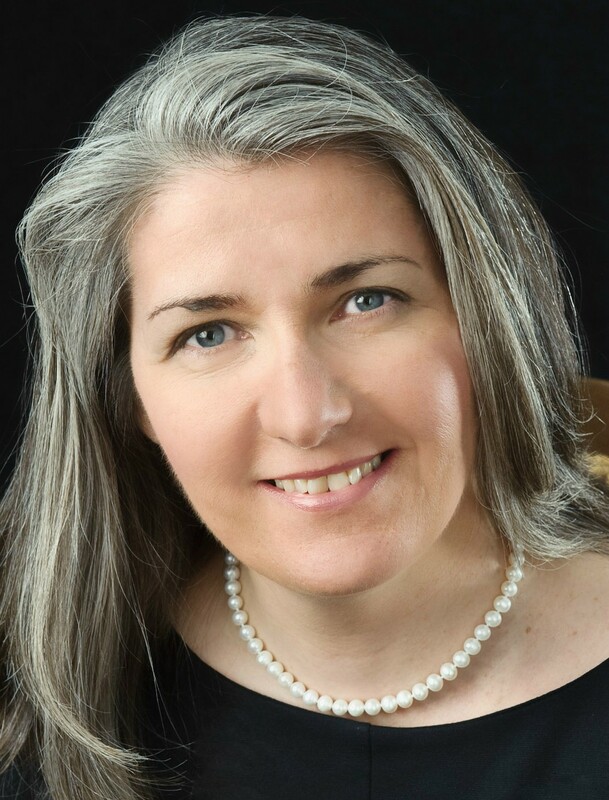 While the film is primarily about the four boys there are three female characters in the story who Pauline Kael correctly complained about in her review get the short end of the lollipop as they are treated as almost non-entities whose lives are only there for the boys and do not matter in any other respect. While one wonders whether four guys like this would really be best friends, Lucas mostly manages to avoid clichés, making his characters real. John Milner is a drag racer and a couple of years older than the other guys, a leftover from the 1950’s dressing like a James Dean wannabe with his cigarette pack tucked up a short sleeve of his T-shirt. Easily Lucas could have made Milner the rebel without a cause we have seen so many times before. But here Lucas and his fellow screenwriters, Gloria Katz and Willard Huyck make Milner, though tough and a protector of his friends, a much more vulnerable almost sweet guy, a softie who spends the entire evening riding around with Carol (Mackenzie Phillips), a thirteen year old nerdy, somewhat annoying young girl. Then there is Steve and Curt, both who see their lives still ahead of them as an adventure, Milner knows he is not going anyway, except another drag race and maybe an early trip to the graveyard. Steve, for all his talk about leaving town, even telling his steady girl Laurie (Cindy Williams) that they should see other people while he’s away, is in the end the most conservative of the group, the nice straight laced kid next door who will always do the right thing, eventually. Portraying Ritchie Cunningham in “Happy Days” a few years later is an obvious natural extension of the same character. Richard Dreyfuss’ Curt is the intellectual of the group. He struggles with leaving, he wants to, yet he hesitant. During the evening he spots a mysterious blonde who seems to whisper “I love you” teasingly as she drives by time and again. He’s intrigued. Old friends, enigmatic girls, does he really want to leave this cocoon of joy? Yet Curt is the sixties, the rebellious future still gestating. Finally, there is the nerd, Terry “The Toad” a goofy kid, the dork of the group who spends the night with Carol, a kookie blonde tremendously portrayed by Candy Clark. Despite being a major smuck, as we use to say back then, the more catastrophes Terry seems to encounter the more she seems to enjoy his company. Terry is an unlikely companion to the others and his character does not ring true. None of the four main characters know what the future holds, who does, the turmoil of the mid to late 1960’s would change them all as we discover in the written epilogue that ends the film. Steve remained in Modesto and became an insurance salesman, Curt is living in Canada, presumably to avoid the draft, Milner was killed in an auto accident by a drunken driver, and Terry “The Toad” was missing in Vietnam. What we don’t find out is what happened to the female characters. Though the film is essentially about the four boys, the female characters, Laurie (Cindy Williams), Steve girlfriend, is a tough young kid who does not want to sit back and wait for him to come back from an East coast college. Mackenzie Phillips’ annoying though entertaining Carol is a realistic shot in the arm, and the offbeat Debbie, who gave Terry an evening he probably never forgot in his short life, is like the other women her future left unknown. 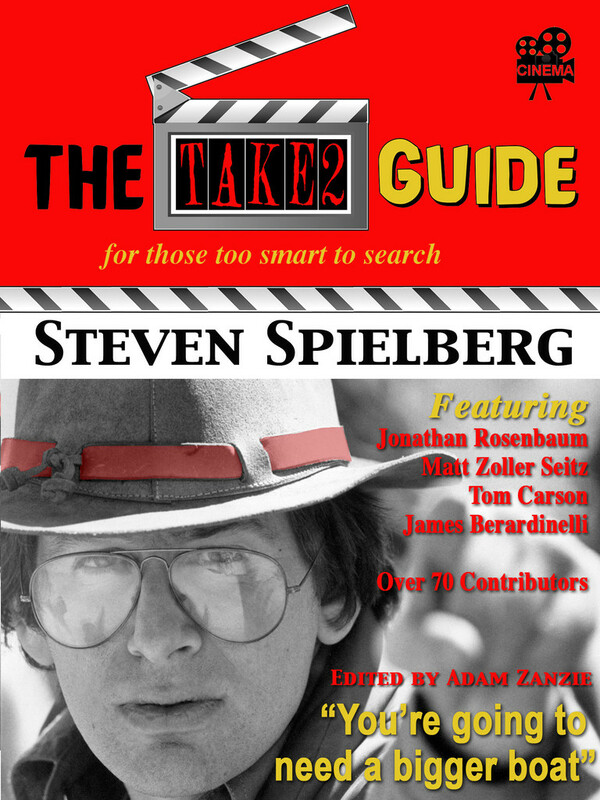 Pauline Kael was not a fan of this film rightly resenting the secondary treatment of the female characters, however she also notes that the male characters, (this is especially true of Ron Howard’s Steve) is a throwback to Mickey Rooney’s Andy Hardy and that Mel’s Drive In is just a replacement for the soda shop. 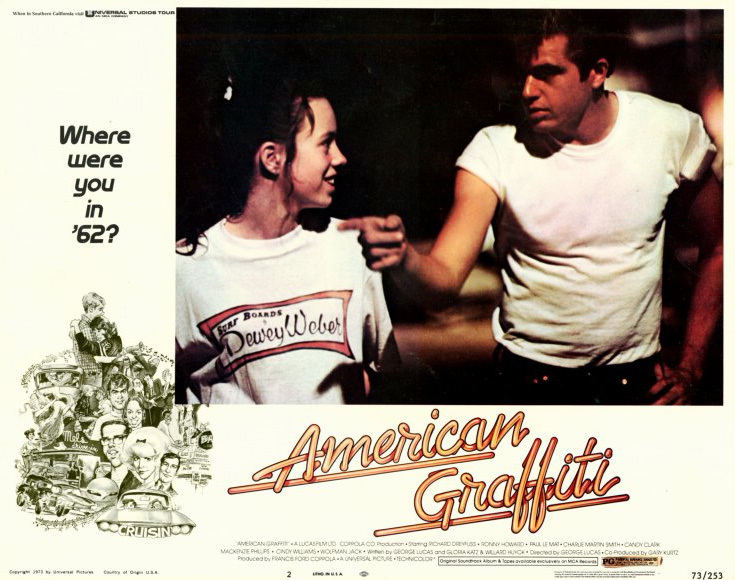 American Graffiti manages to be nostalgic without the weepy sentimentality. The characters face life changing decisions for the first time in their lives, at least Steve and Curt do. Lucas’ use of a soundtrack is perfectly in synch with the storyline. Like Scorsese his selection of songs is appropriate to what is happening in the scenes. The music adds flavor to the atmosphere and is not just background music. At the times of its release, the now well known cast consisted of a whole group of newcomers. To tell you the truth, I cannot think of another film than had so many future stars in it. Best known was Ron Howard, already a TV star for his role as Opie in “The Andy Griffith Show.” Still, let’s face it; his name wasn’t exactly like saying Robert Redford. The rest of the cast were even lesser known but what a list it turned out to be; Richard Dreyfuss, Cindy Williams, Candy Clark, Harrison Ford, Suzanne Summers, Mackenzie Phillips, Paul LeMat, Kathleen Quinlan among some other actors who became known in supporting TV roles like Debralee Scott (Welcome Back, Kotter) and Joe Spano (currently on NCIS) . Dreyfuss, Clark and Cindy Williams are true standouts in their roles. 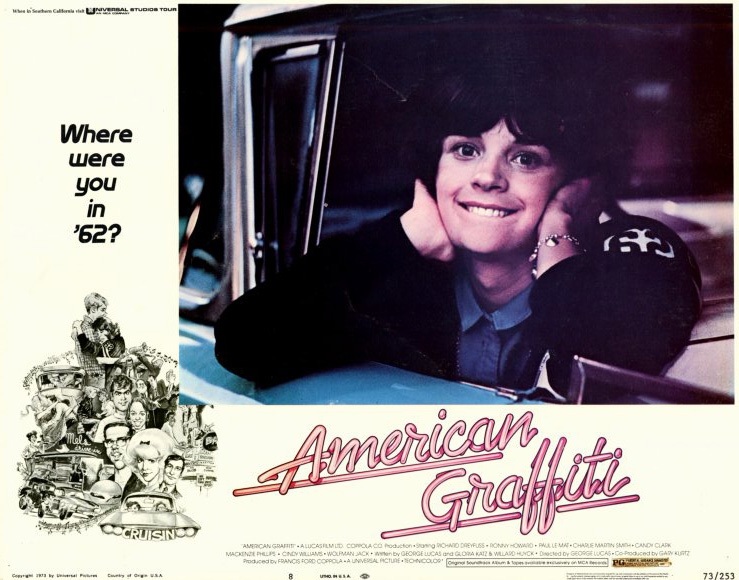 This entry was posted in 1970's, Film Reviews, George Lucas and tagged American Graffiti, Candy Clark, Charles Martin Smith, Cindy Williams, George Lucas, Harrison Ford, Paul LeMat, Richard Dreyfuss, Ron Howard. ← Newspaper Movie Ads of Yesteryear #5 – Held Over! I remember enjoying this a lot – not sure when it was released in the UK, as the imdb doesn’t say, but maybe a year or two later? Also not sure if I saw it on release anyway, might have been a few years later. I must admit I hadn’t realised Harrison Ford and some of the others were in it – I do remember that Ron Howard was the biggest name at the time. As you say, a real cast of stars in the making. 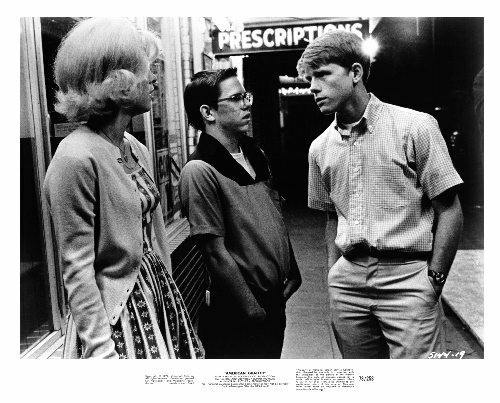 For some reason I find I tend to get this film mixed up with ‘Diner’ (Barry Levinson, 1982), another coming of age tale about a group of friends, set in 1959, which also had a great cast of unknowns, Kevin Bacon, Mickey Rourke, Ellen Barkin,Steve Guttenberg – I really need to see both of these movies again to separate them out in my mind! “Diner” was a good film too and as you mention had a great cast of newcomers also. I have to revisit “Diner.” Have not seen it seen it came out. I completely agree John, that the music here adds to the flavor, rather than just serving as an aural underpinning. Indeed, this celebration of 60’s culture in the US is in fat the death knell of the lifestyle that ends with the cultural revolution of the early 60’s. It remains one of Lucas’ most beloved and accomplsihed works, and it’s a time portal to a time gone forever, a blissful remembrance. You have done the work glorious justice here. Thanks Sam, This film and the play “Grease” which opened on Broadway I believe in 1972, kind of kicked off the 1950’s nostaglia craze that went on during the 70’s. I grew up in Modesto. Cruising was our life in high school. My mom told me a lot about her cruising days there in the late 50s and early 60s. Hard to imagine my mom crusing in the same time era as George Lucas. Cruising – a tradition that has been handed down from one generaton to another…and will probably go on as long as there are cars, guys,girls and music. Thanks! 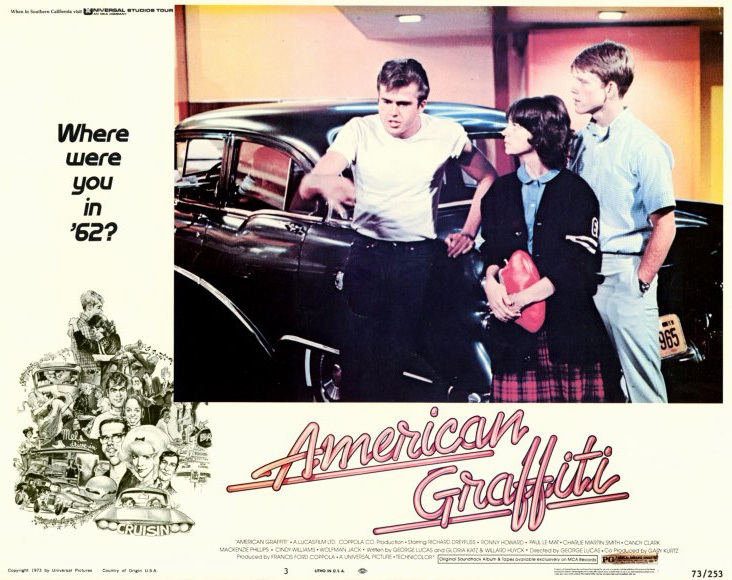 I remember seeing AMERICAN GRAFFITI when it was released…it was a sensation, very different from “nostalgia-esque” films. Not sentimental at all, a great screenplay, very fine ensemble cast and meticulously selected music. The reference in the epilogue to Vietnam (Curt and Terry) was potent, that war was still a hot button in 1973. Some of the picture was filmed in San Rafael, CA, where I live. I knew someone who was an extra in the film and every time I see the scene of the high school dance when the kids line up to do “The Stroll,” I watch her dance down the line and think – she’s just a little bit immortal. Lucky lady. As for Pauline Kael…this was George Lucas’ take on the early ’60s…not a PC treatise…and it works. Thanks for some astute comments here. Yep, this was a huge hit at the time, as was the soundtrack. When I saw it the line to the theater went around the block. Thanks for sharing the story of the person you knew who was in the film, that is cool. John, a really thorough and evocative post on a film I like very much. I didn’t see it until a few years after it was released. It’s basically entertainment, but Lucas gives it enough substance to keep it from being total fluff, and as you imply, anyone who lived through those times can’t watch this film without thinking how naive and, well, complacent, we were then. I certainly agree with you about 1962 being the last year of the 1950s–the Kennedy assassination was the sudden end of that era. The story was about four guys, so the secondary roles of the girls never bothered me. Still, Candy Clark was as memorable as any of the male characters. Lucas’s use of music was remarkable. He correctly perceived how important music was to these kids, how it was the soundtrack of their lives. However, I’ve always thought the music was a little out of date for 1962, closer to the music of 2-3 years earlier. And I think it was the start of an unfortunate trend of overusing pop songs as a lazy way to evoke emotional responses instead of using the narrative to do this. The way Lucas used pop music seemed appropriate for this movie, but too many films since have used this device for no good reason. Few directors used pop music as well as Lucas did here, or Scorsese does in his films (Mean Streets, Goodfellas). For most all it means is the ability to create a soundtrack and sell a million albums or so. For me, what makes this film stand out is its ability to evoke a nostalgic feel without the weepy, corny sentimentality that we often see. As for the songs, you’re right, many are from the 1950’s (The Stroll, Ain’t That a Shame, At The Hop) in fact, most songs on the soundtrack are! Not sure why that decision was made. That said, it is better to have older songs that believably could have been played on the radio than having a song that was not released until say 1964 or so which has been done in other films. Attempting to evoke an era with music that was not even released yet is just plain bad. Still Lucas could and should have used more songs from 1961 and 1962. 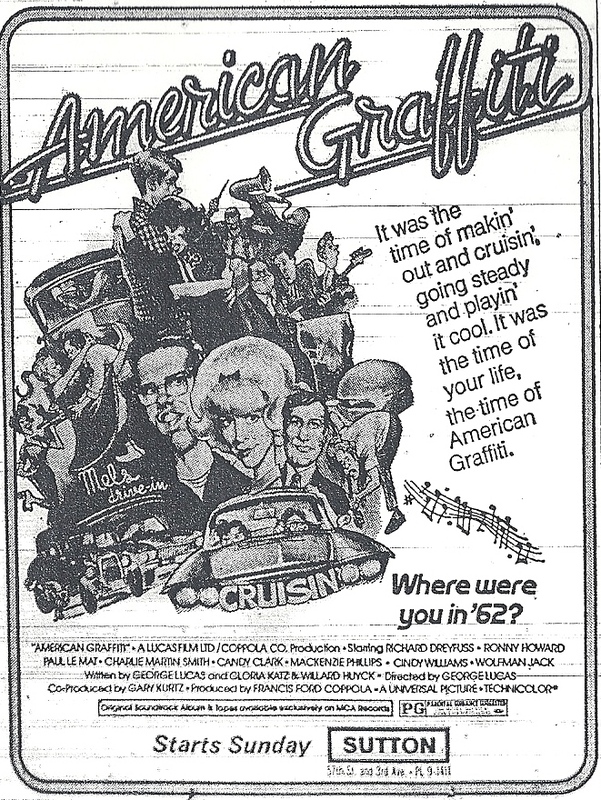 I have some thoughts on possibly why much, though not all, of the music in AMERICAN GRAFFITI wasn’t current to the year(1962)in which it was set. Prior to the British Invasion, pop music changed fairly gradually from the mid-’50s forward. Dances like “The Stroll” (1958) were still featured at school dances years after the song itself was a hit. The phrase “oldies but goodies” came into use in 1957; the first album compilation of oldies was released in 1959 and met with great success. Many sequels followed. There was even a hit song in 1961 titled, “Those Oldies But Goodies.” By 1962, “oldies but goodies,” “golden oldies,” etc., had a place on the “top 40” playlists of the day. Some stations even featured “oldies” nights, etc. Later the genre became a programming format. So I think there is an argument that the songs from the late-’50s still work in 1962 – that along with the idea that the ’50s lasted through 1962 – until Nov. 22, 1963, perhaps. Good points LE! There even was a series of LP’s that came out during those years featuring oldies, if I remember correctly one called OLDIES BUT GOODIES and the other other series was GOLDEN OLDIES (both I think were on the Roulette label). And now that you mention it I can remember going to a local mom and pop record store where in addition to selling the top 50 or so 45’s the store had a bin where they sold oldies. BTW the song THOSE OLDIES BUT GOODIES was originally sung by Little Ceasar and the Romans. Very interesting thought. I read this a few days ago and didn’t get it out of my mind. And are we really living within the 21st century already. Well, I doubt that. But back to the 50s – you can divide them in two parts as well: Before the Rock&Roll hype dominated, the 50s were pretty mushy, very much like the late 40s. Good point about when the 50’s really began. 1955 was when Rock and Roll began to be noticed…and that same year there was REBEL WITHOUT A CAUSE giving birth to the modern day teenager! Weren’t THE JETSON’s living in the 21st Century (lol). If so, we are way behind.